Join us to celebrate the CAN Japanese Festival during the month of May, as we highlight the rich variety of traditional and contemporary arts and culture of Japan. There will be exhibitions for you to visit, plus events and workshops to experience during the whole month. ‘City Treasures from Japan’ is an exhibition that showcases the many gifts that Napier City Council has received over the years from Napier’s twin city Tomokomai in Northern Japan. These items are usually stored in the archives, wrapped carefully in boxes. Generously, they have agreed to loan several items to CAN so that they can be placed on public display to coincide with the CAN Japanese Festival. This exhibition follows on from the 2018 popular ‘City Treasures’ exhibition, which offered a rare opportunity for the Napier public to view all the items gifted from Napier’s three twin cities. 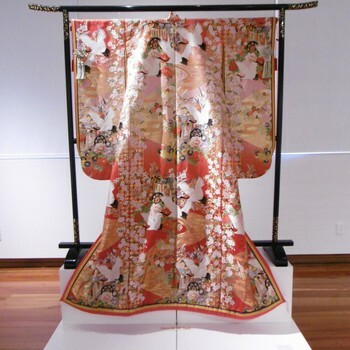 Taking centre stage was the stunning kimono (pictured above); ‘The Uchikake was donated to Napier City on the 13 November 2010 as the commemorative gift of the 30th anniversary of the sister city relationship with Tomakomai. Uchikake is a kind of Kimono which is often dressed as a bridal gown’. Seeing this kimono on display inspired visitor Chieko Hayashi to book the Small Gallery in May 2019 to display her collection of hand embroidered silk kimono, which she has brought over from Japan. This exhibition will also be on display during the CAN Japanese Festival. The Napier Mayor, Bill Dalton will open the ‘City Treasures from Japan’ exhibition, and the CAN Japanese Festival, which runs for the month of May. Join us to celebrate at the official opening event on Friday 10 May, 5-7pm. In addition Chieko Hayashi will be in attendance for the opening of her exhibition in the Small Gallery on the same night. All welcome! Light refreshments will be served. City Treasures from Japan; An Exhibition of Napier Treasures Join us to celebrate the CAN Japanese Festival during the month of May, as we highlight the rich variety of traditional and contemporary arts and culture of Japan. There will be exhibitions for you to visit, plus events and workshops to experience during the whole month.